The air feels refreshingly cool and humid against my skin. I can hear water running and look up at a huge mountain covered with beautiful green plants, flowers, and a gigantic waterfall. 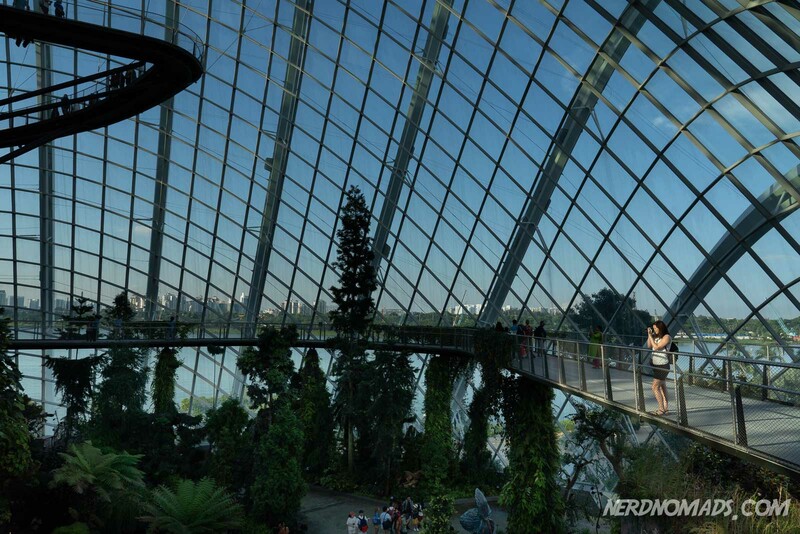 We have entered the high-tech botanical gardens of the future – The Cloud Dome inside the Gardens by The Bay Singapore! 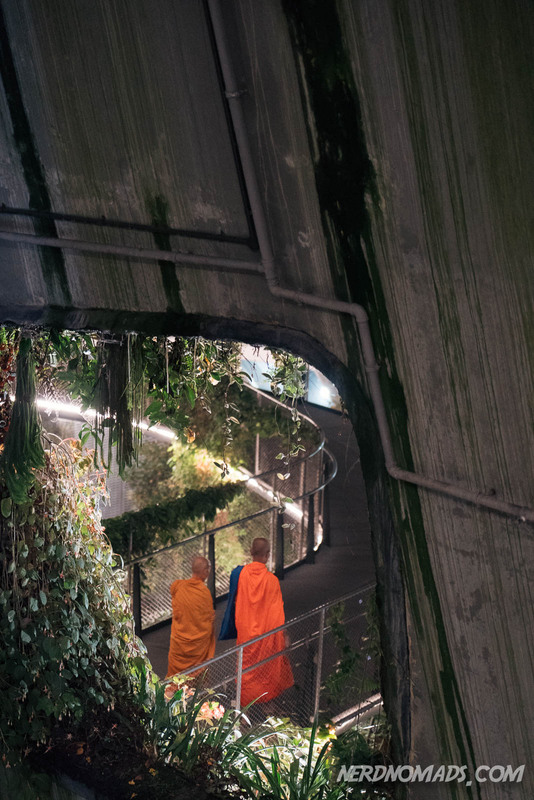 It feels like we have left our world behind and stepped into the lush alien world of Pandora. Created in 2012 as part of Singapore’s government strategy of making Singapore into a “City In A Garden” and to increase the quality of life with trees, plants, and flowers, the Gardens By The Bay is an enormous futuristic botanical garden. 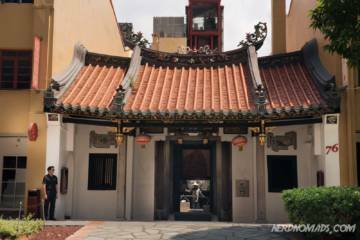 It cost S$1 billion = US$ 726 425 000 to build, money well spent if you ask me as it is truly magical and like nothing, I have ever seen! It is the Rolls Royce of botanical gardens. 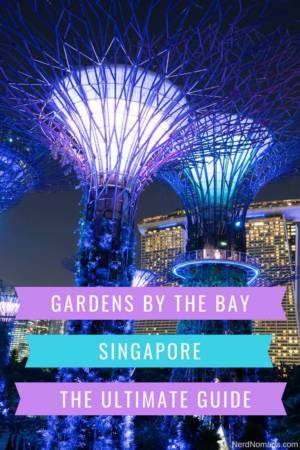 Beautifully located right by the waterfront of Marina Bay, the Gardens by the bay consists of three parts: Bay South Garden (the most prominent part, 54 hectares), Bay Central Garden, and Bay East Garden. The Bay South Garden is the highlight of Gardens By The Bay and the part that gets most visitors as this is where the iconic and famous Supertrees are located, as well as the Flower Dome and Cloud Forest Dome. 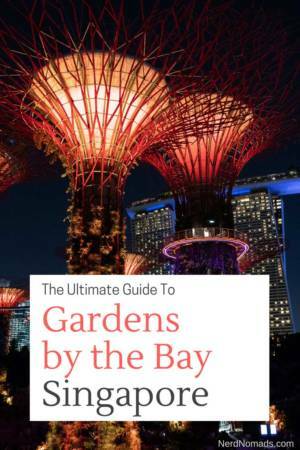 Bay East Garden is the second largest part and is a green lung in the city of Singapore, offering great views of the city skyline. The Bay Central Garden is the link between the South and East part and is a 3 km waterfront promenade, perfect for walking and running and offers a stunning view of Singapore. With its 101 hectares of green and lush delight, housing more than 217 000 (!) 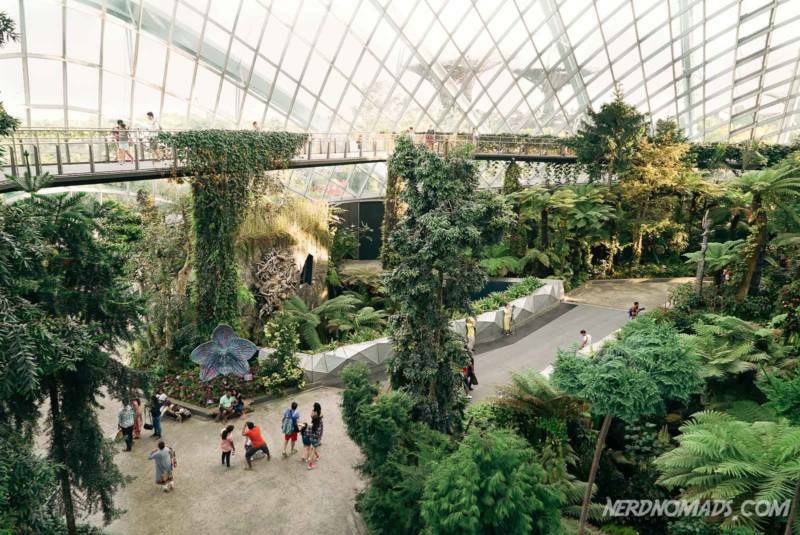 plants from over 800 different species, it is Singapore’s largest green jewel and urban outdoor recreation area and a must-visit if you are in Singapore! 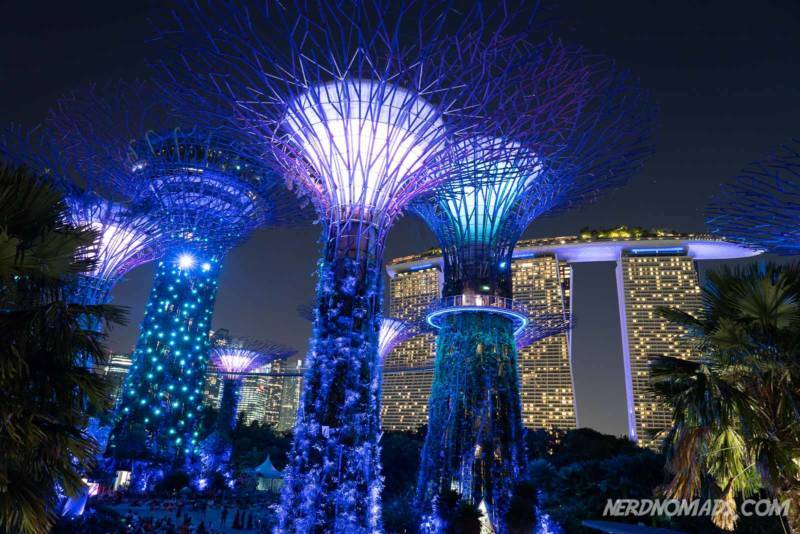 These sci-fi trees are like taken out of the movie Avatar and are soooo cool! 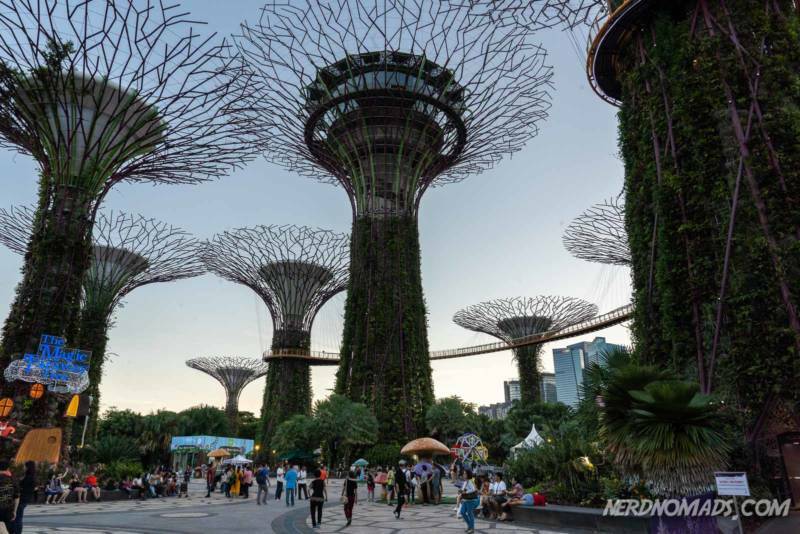 There are eighteen Supertrees in Gardens by the bay in total, where twelve of them are put together making a cluster of trees called the Supertree Grove. The trees are of different heights ranging from 25 to 50 meters tall. 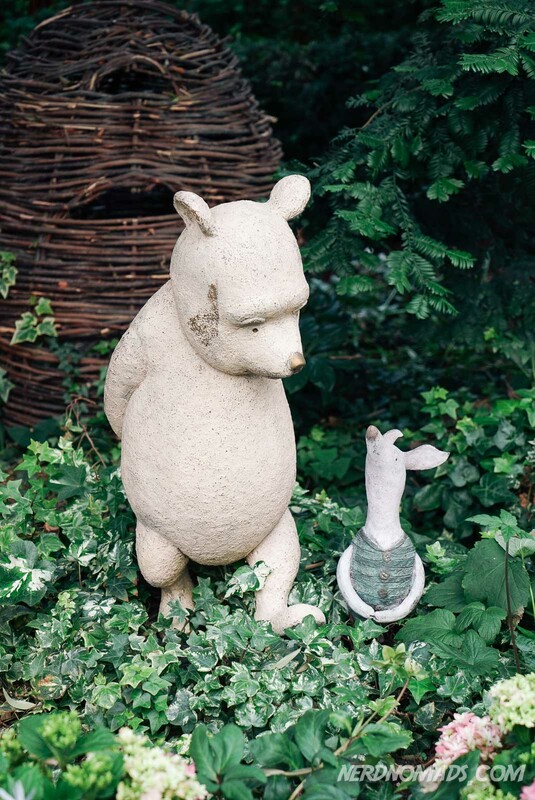 The daily light-and-sound show Garden Rhapsody is a must-see! 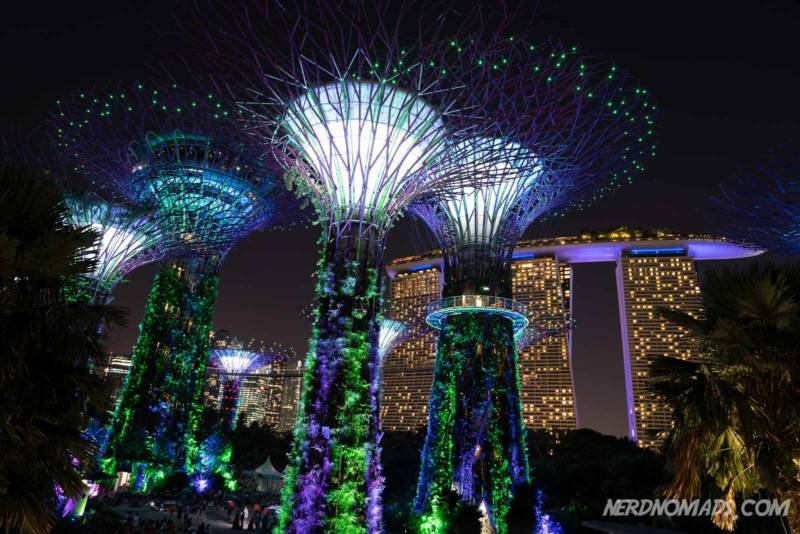 It feels like being right in the middle of a sci-fi movie watching the Supertrees covered with 162 900 plants light up in a spectacular light show accompanied by music. 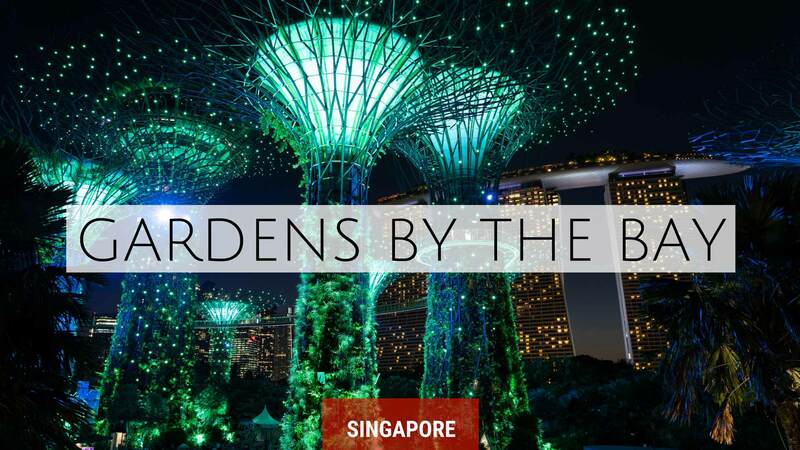 The Gardens by the bay light show is shown every day at 19:45 and 20:45. The tallest Supertrees even has a restaurant, the IndoChine, serving a mix of Indochinese and Western cuisines. 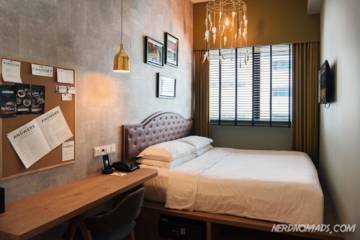 Here you can chill out and have a drink at the alfresco rooftop bar or dine in the fully air-conditioned lounge while you admire the stunning view. The Supertrees are cool in so many ways, not only the visual. They are packed with environmental technologies that mimic the ecological function of real trees. They have for instance photovoltaic cells that harness solar energy to produce power that lights up the trees, which resembles how real trees photosynthesize. 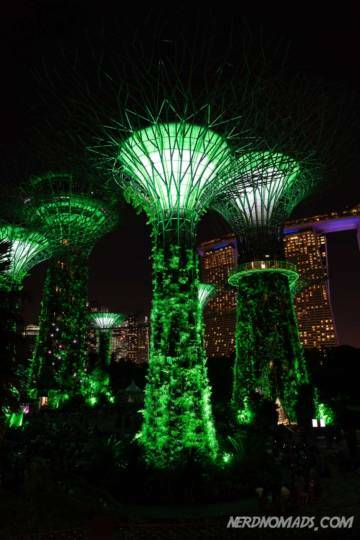 The Supertrees Singapore collect rainwater used in irrigation, just like how real trees must absorb rainwater to grow. 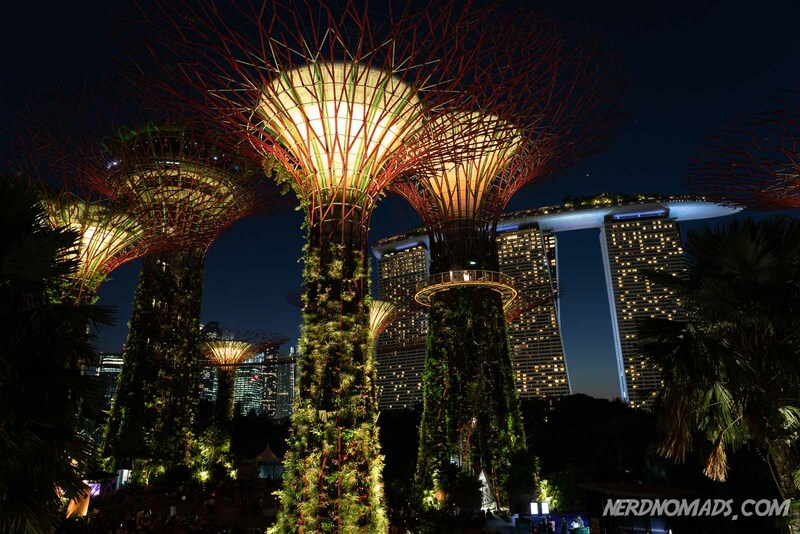 The Gardens by the Bay has several fountains which also use the rainwater. 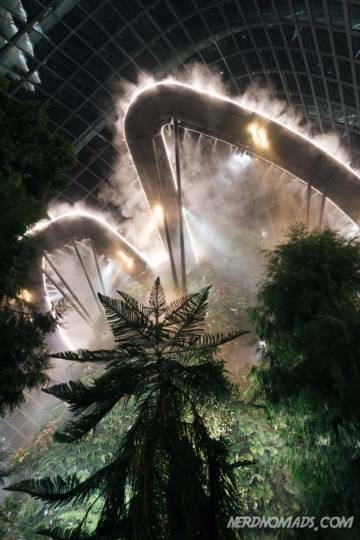 The Supertrees also help out with running and cooling the Flower Dome and the Cloud Forest Dome. 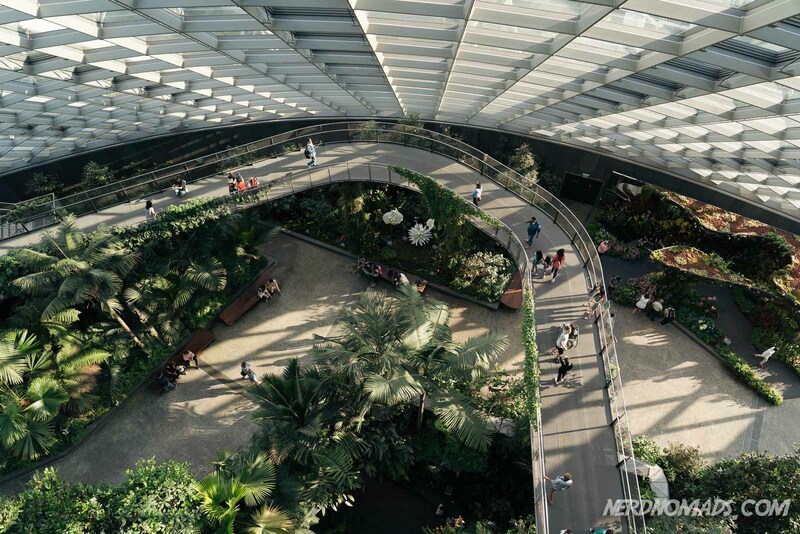 The 22 meters high and 128-meter long canopy called the OCBC Skyway was sadly closed for constructions when we visited Singapore, but it is one of the highlights of the Gardens by the bay. The canopy connects six of the Supertrees in the Supertree Grove so you can get close to the trees and its plants. 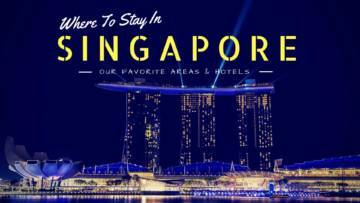 It is the perfect place to get a stunning view of the skyline of Marina Bay. You have to buy an extra ticket to get up to OCBC Skyway. Ticket price OCBC Skyway: S$8 for an adult = US$, S$5 for a child (8-12 years old) = US$4. To skip the ticket queue and save money, buy your discounted e-tickets here in advance. The tickets are flexible, so you can book them now and use them any time within the next 180 days. 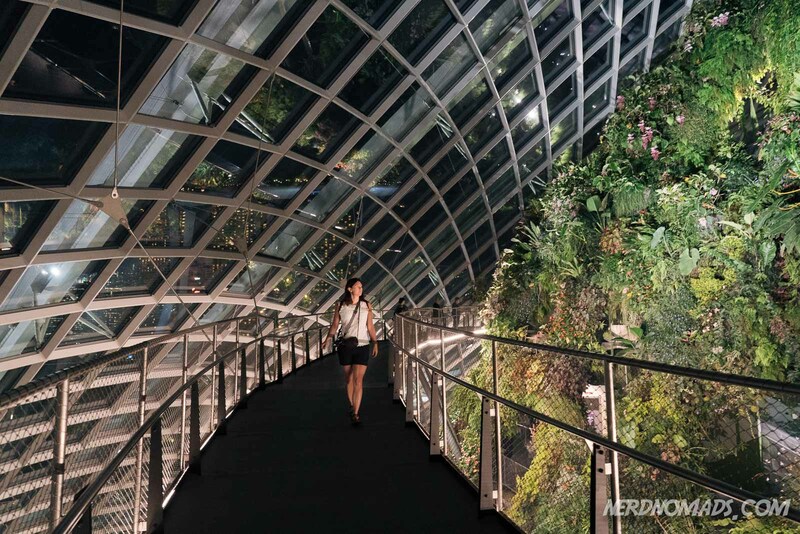 Gardens by the Bay has two cooled conservatories; the Flower Dome and the Cloud Forest Dome, each with a unique interior layout and containing different plants and exhibitions. The Singapore skyline view from the two Domes is terrific! The domes are unique worldwide as they are energy efficient and sustainable buildings where the goal is to minimize the environmental footprint. 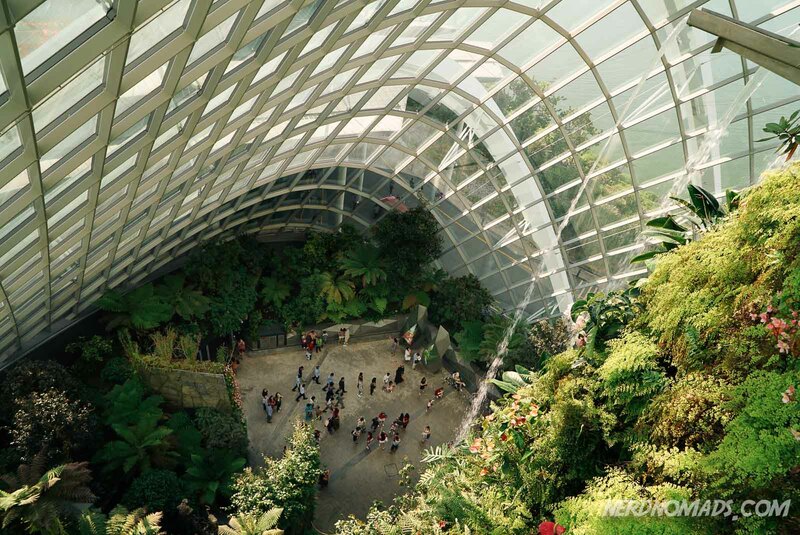 They use a pretty cool and unique technology system where rainwater is collected from the surface of the domes and circulated into the cooling system. The cooling system and the Supertrees outside are connected, used both to vent hot air and to cool circulated water. Pretty impressive! Uniquely these huge glass-roof structures have been built without any additional interior support like columns. 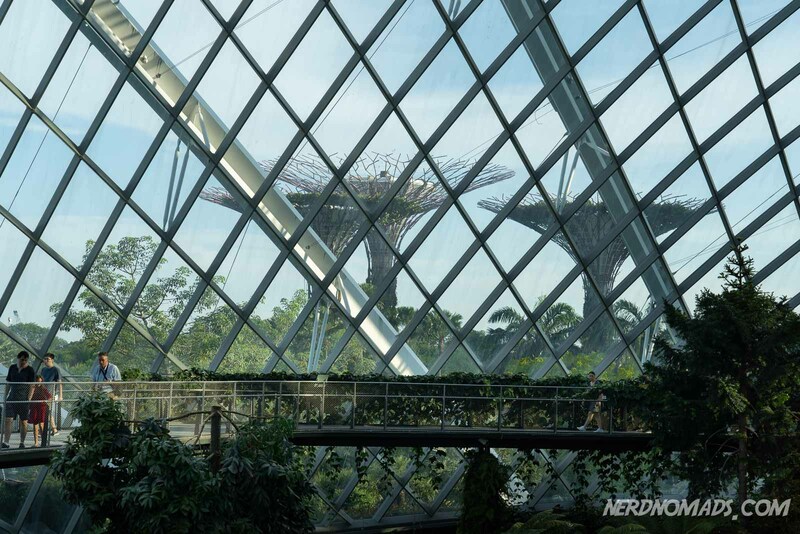 The domes have no additional interior support like columns, which is pretty unique for these kinds of huge glass structures. 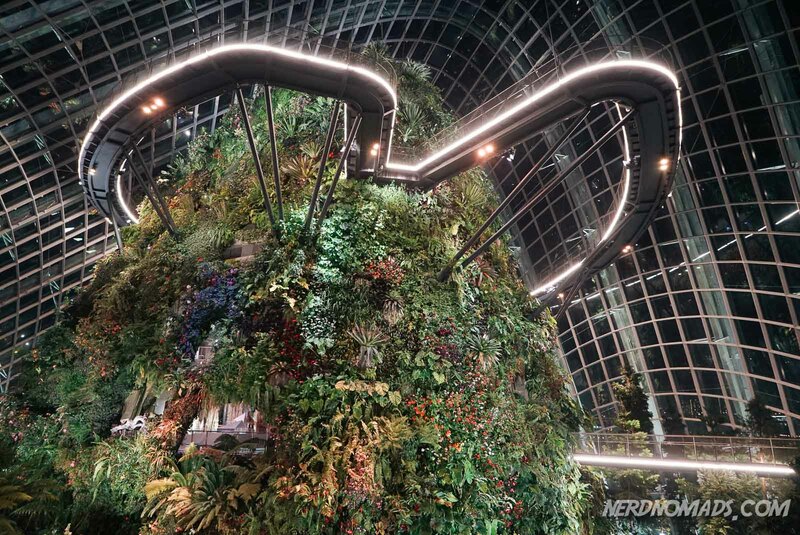 The giant glass “egg” Gardens by the Bay Flower Dome is packed with beautiful flowers and plants, divided into seven different gardens each with its theme. 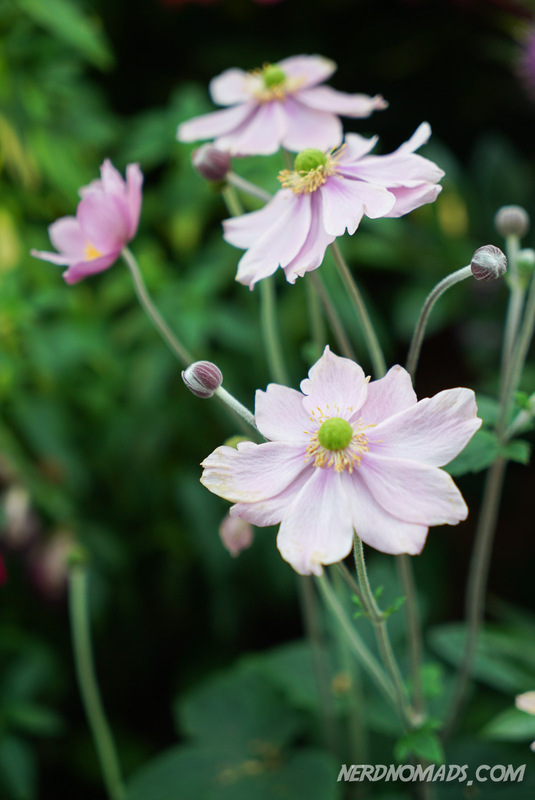 The flower display changes frequently to reflect the seasonal changes and festivals. 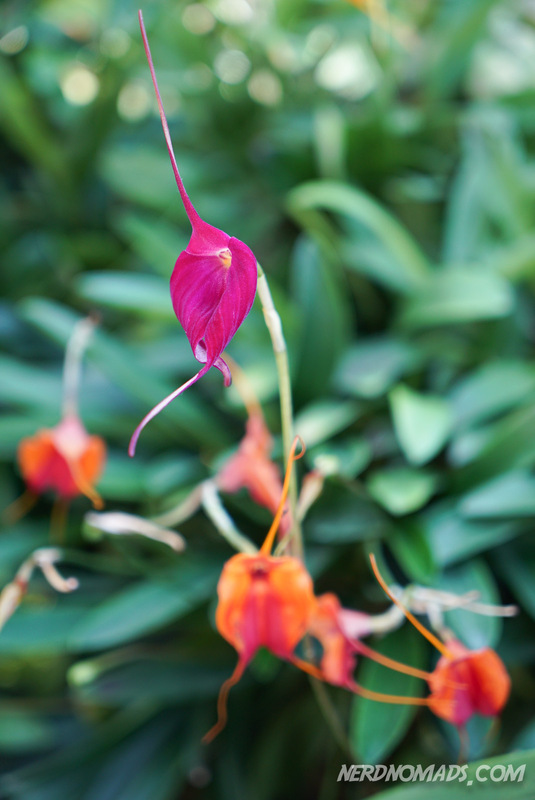 When we visited, the beautiful and colorful “The Orchid Extravaganza” display was showing. Since orchid is my favorite flower, I absolute L-O-V-E-D it! 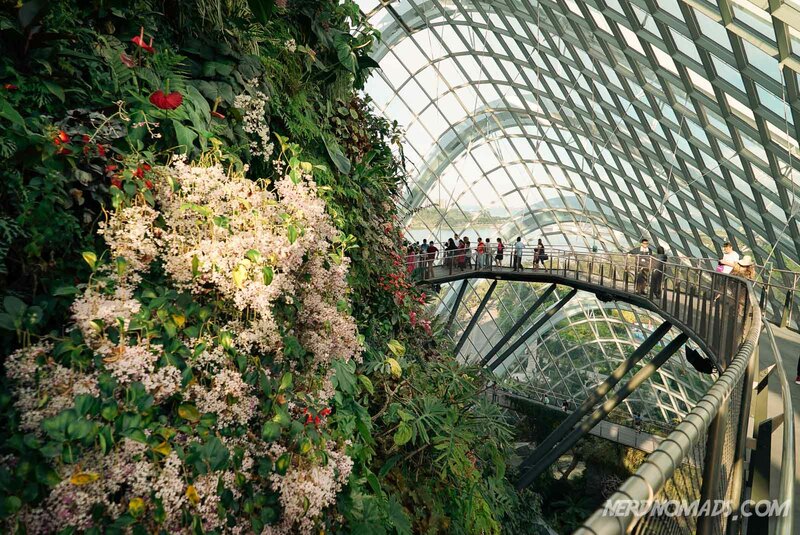 The Flower Dome in Singapore is the world´s largest glass greenhouse with a heigh of 38 meters and 1300 m². The air is kept cool (23-25 C) and dry (60-80% humidity) like the Mediterranean climate. 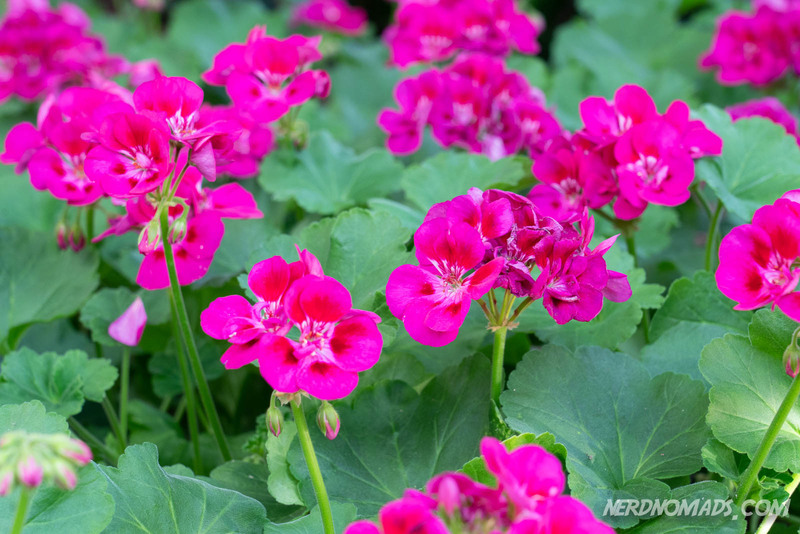 These are the perfect growing conditions for exotic plants from for instance Australia, South America, and South Africa. The Flower Dome also houses the sophisticated restaurant Pollen, in the middle of an olive grove, serving modern European cuisine where some of its ingredients come from the Garden. 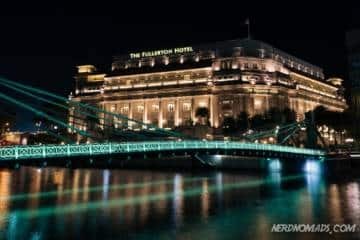 The restaurant has a magnificent view of Marina Bay and Singapore skyline. 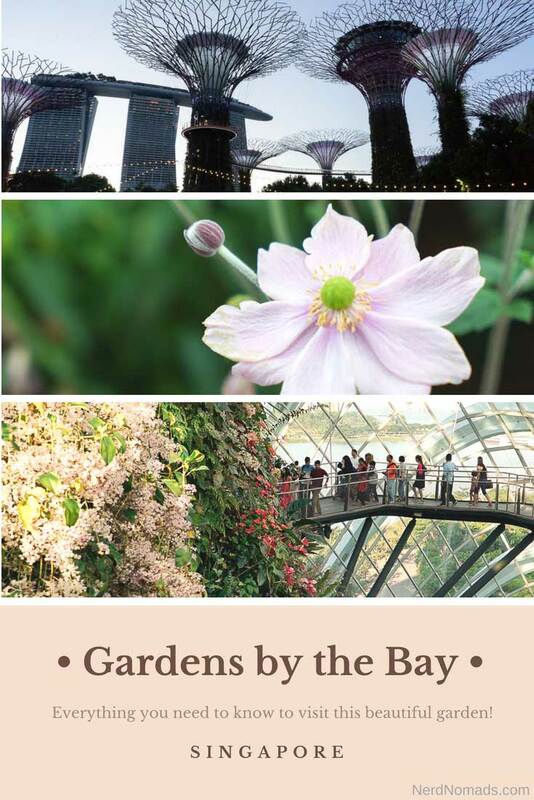 Ticket price Flower Dome + Cloud Forest Dome: S$28 (adult) = US$20, and S$15 (child 3-12 years old) = US$11. To skip the ticket queue and save money, buy your discounted e-tickets here in advance. The tickets are flexible, so you can book them now and use them any time within the next 180 days. The Flower Dome is nice, but for me, the Cloud Forest Dome was the one that was most impressive! We even visited it twice as it was so fantastic. 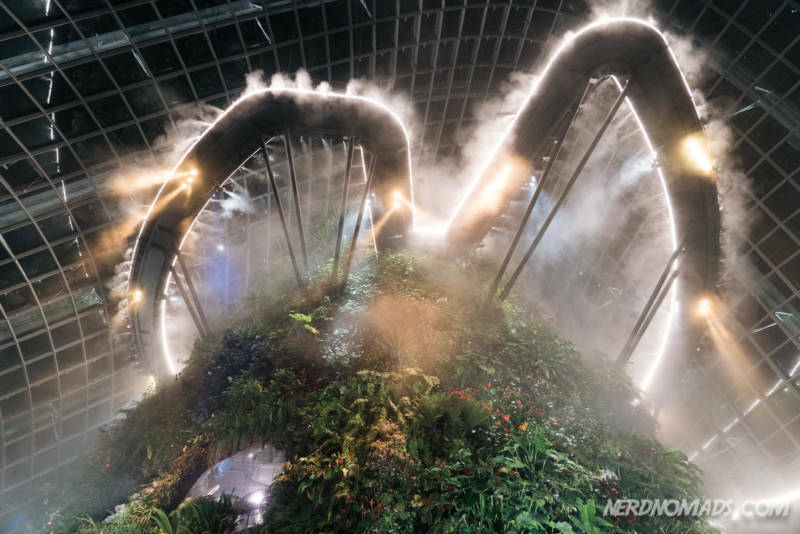 When entering this dome, it feels like stepping into a dense, steamy and humid tropical jungle, kind of like the Amazonas (although I must admit that we have not been to the Amazonas yet…..but this must be how it feels like…kind of). 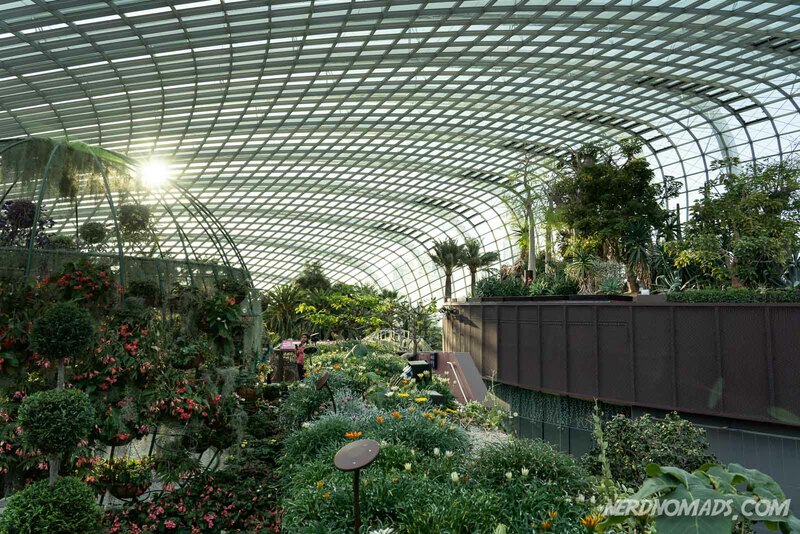 The temperature inside the Cloud Forest Dome is between 23 and 25 C, and the humidity is 80-90%, which is the same as the tropical montane climate found between 1500 and 3000 meters above sea level. It is the perfect environment for plant life from tropical mountain areas in South-East Asia, Middle- and South America. 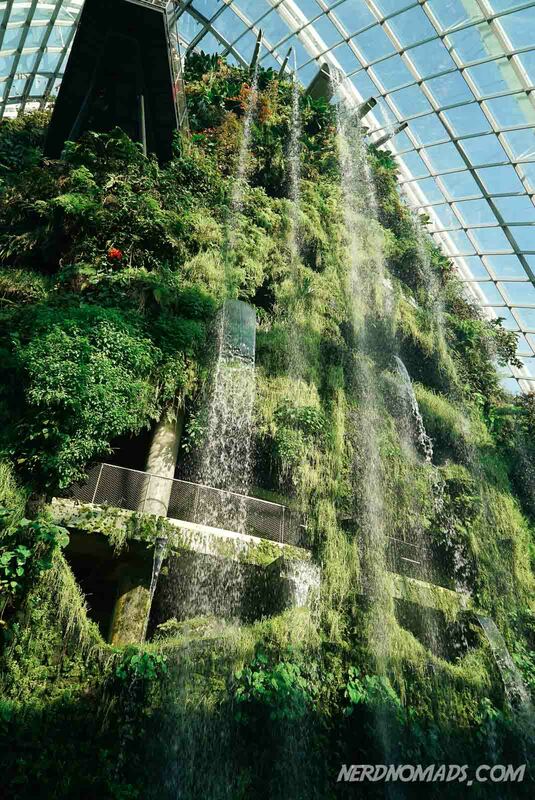 As you enter the Cloud Forest Dome, you know this is going to be excellent as you are welcomed by a gigantic 35-meter tall waterfall at the entrance. You can let the water droplets cool you down if you go close enough. The waterfall is the world´s biggest indoor waterfall, 35 meters tall. As you follow the walking path called the Cloud Walk, you go around and up the big green mountain “Cloud Mountain” giving you a great view over the Cloud Forest. I loved the Cloud Walk at the top of the mountain where you walk on an airy path on the outside of the mountaintop, taking you to the plateau below. The view from this walk is spectacular! Also, the Treetop Walk is cool, where you go through a tunnel of green jungle plants and into a canopy walk with great views. There is, however, also an elevator. Here you walk among the top of the tall palm trees giving you a great bird’s eye view of the treetops. 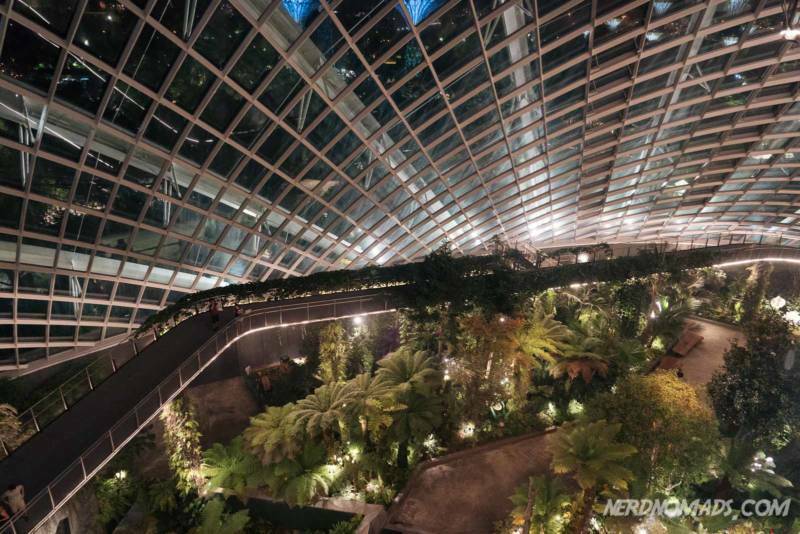 At the top of the Cloud Mountain (35 meters tall), you enter the Lost World which showcases cloud forest vegetation generally found at 2 000 meters above sea level. 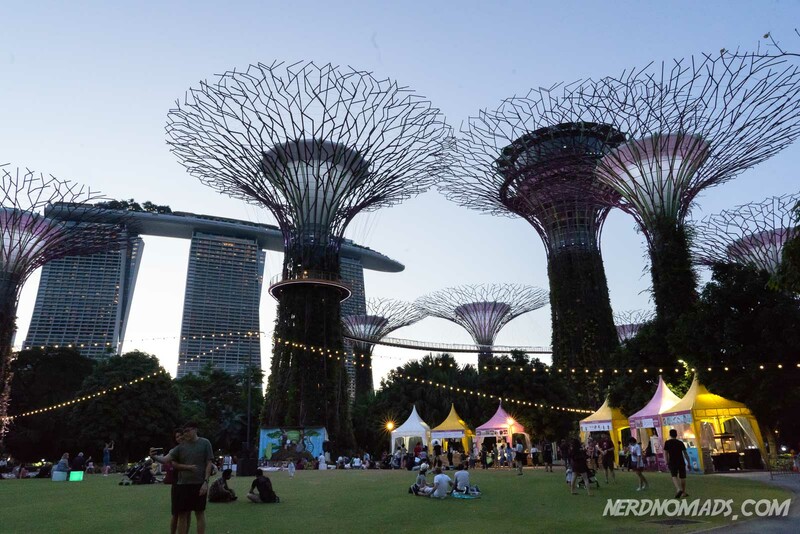 From here you get a fantastic view of Marina Bay, the Supertrees, and the rest of Gardens by the bay. 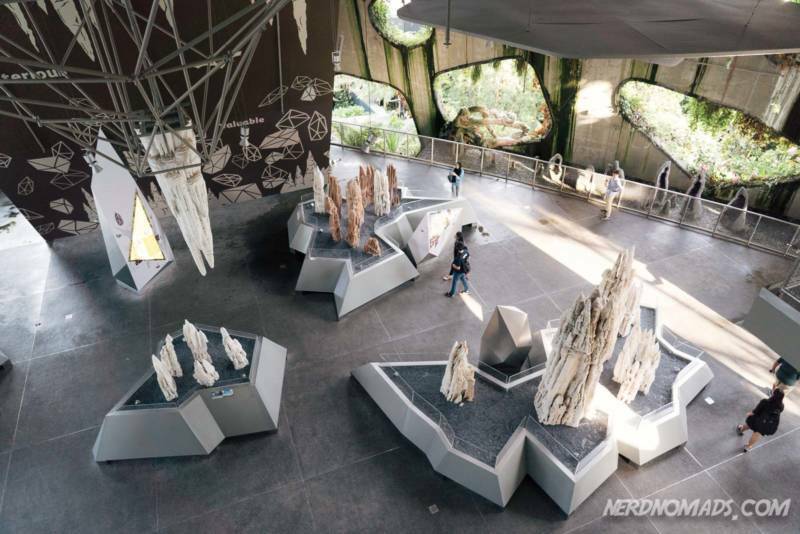 You can also step inside the mountain to the Crystal Mountain Cave, a display of different shapes of real stalactites and stalagmites. The cave is a geologists heaven where you learn more about geology, how the various continents are formed, the age of the earth, and the importance of fossils in understanding our planet’s past. The Cloud Forest Theater shows a film about how we all can contribute to conserving nature and water to get a more sustainable world and future. 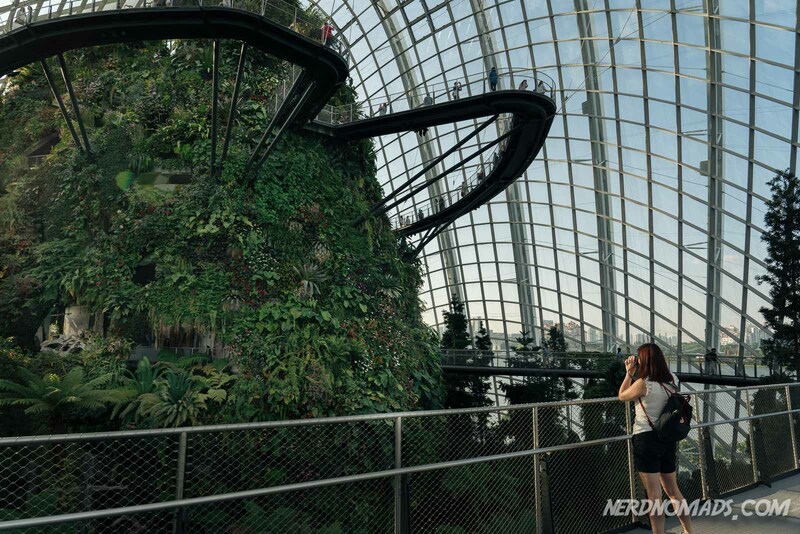 The displays shift by seasons at the Cloud Forest Dome. When we visited, they had recreated their award-winning orchid display, “In a cavern, in a canyon”, which won Gold and Best of Show at the 22nd World Orchid Conference (WOC 22) in Ecuador November 2017. The display was stunning! We ended our visit to the Cloud Forest with a walk through the Secret Garden which is fantastic! The Secret Garden consists of limestone forests and caves covered by more than 7 000 plants of more than 135 species. Many of the plants belong to the gesneriads, begonias, orchids and ferns families. Ticket price Flower Dome + Cloud Forest Dome: S$28 (adult) = US$20, and S$15 (child 3-12 years old) = US$11. If you want to avoid the long ticket queue and save money, buy your discounted e-tickets here in advance. The tickets are flexible, so you can book them now and use them any time within the next 180 days. Gardens by the Bay are Singapore’s biggest green lung and have something for everyone. 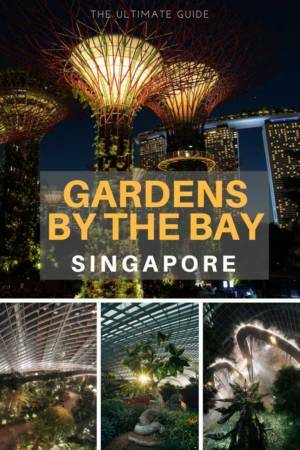 No matter if you like awesome architectural masterpieces, impressive high-tech technology, or beautiful plant and flower arrangements, a visit to the Gardens by the Bay should be on your Singapore itinerary. 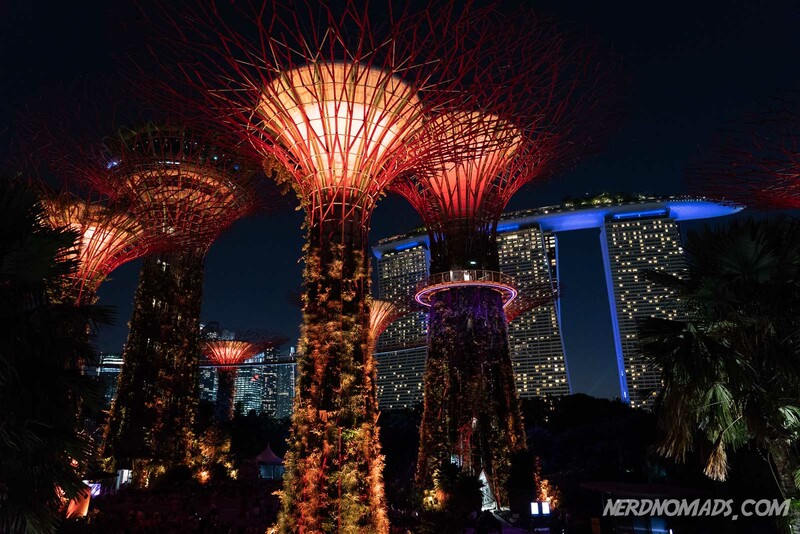 The star of the Gardens by the Bay is the Supertrees in the Supertree Grove with its Garden Rhapsody light-and-music-show as well as the OCBC Skyway. But also the Cloud Forest Dome and the Flower Dome are fantastic and well worth a visit. 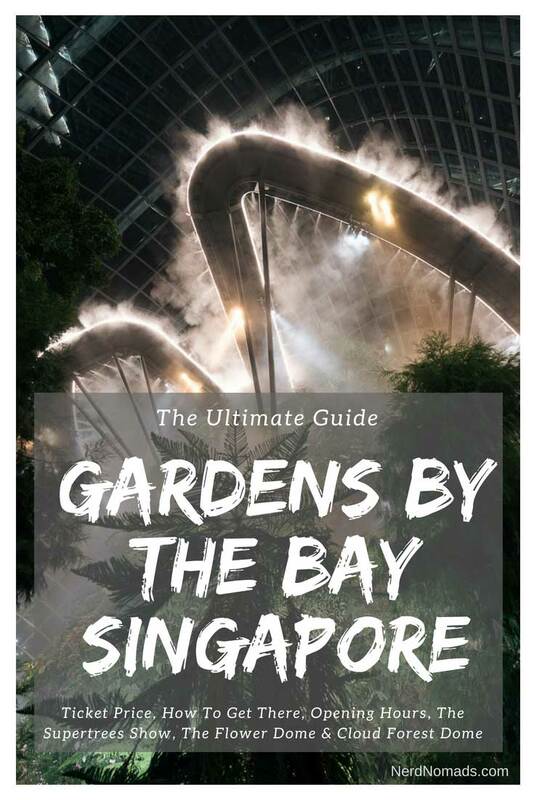 We bought e-tickets to Gardens by the Bay and the OCBC Skyway here in advance and saved a lot of money. That way we skipped the long waiting line for tickets. Very easy and convenient! The tickets are flexible, so you can book them now and use them any time within the next 180 days. 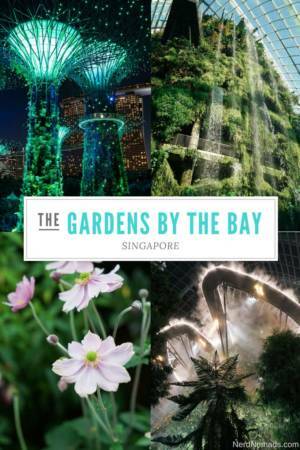 The Gardens by the bay also offers a great selection of restaurants and cafes and gift shops. 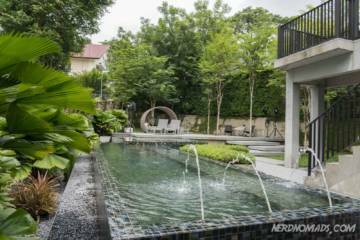 There is also a Children’s Garden where the kids can play and be interactive with water, trampolines, balance beams, hanging bridges, and learn about mother nature. 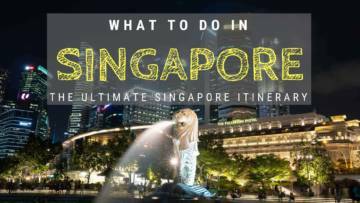 When walking around the park along the many beautiful walking paths, you will find several fantastic art sculptures and enjoy a great view of Marina Bay and Singapore skyline. You can easily use at least half a day at this huge park. 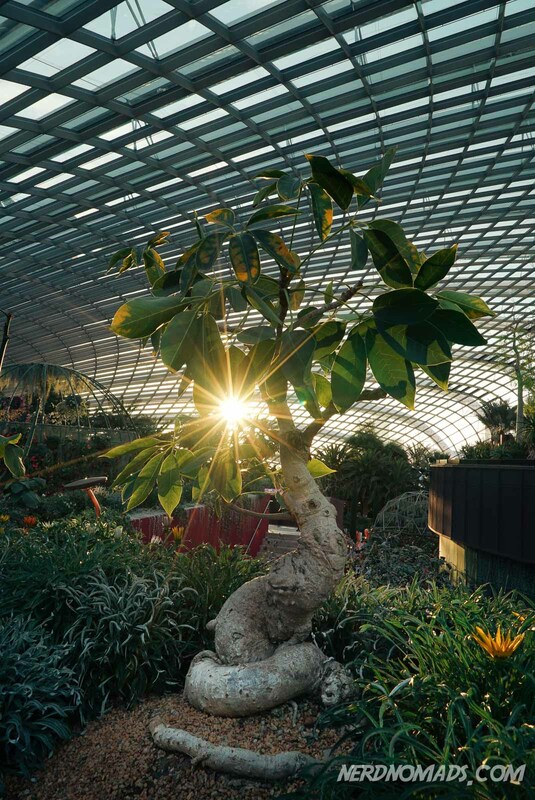 There is never a dull moment at Gardens by the Bay Singapore! 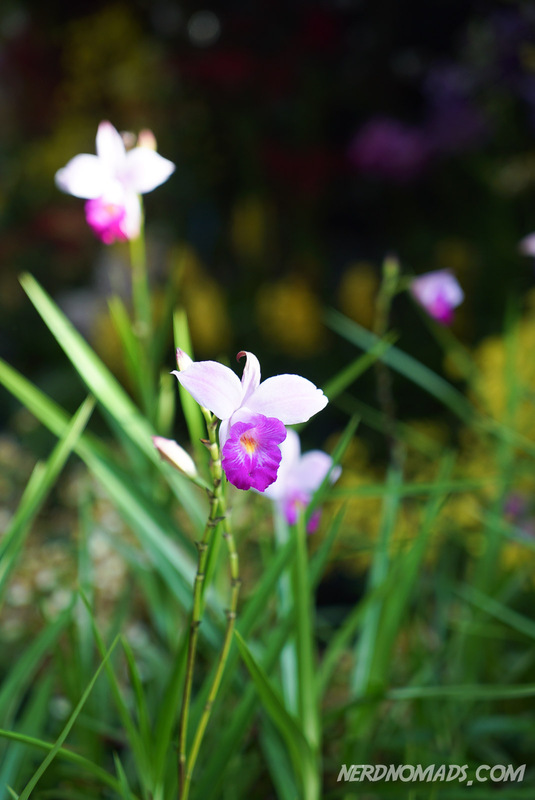 If you like gardens, then also check out the beautiful Singapore Botanic Gardens. Thank you so much! 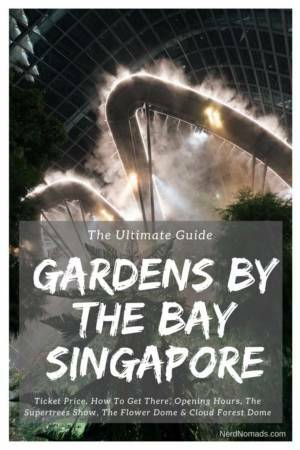 The Gardens by the bay is amazing and I`m sure that you will not be disappointed! I have actually not seen that movie yet, now I definitely want to see it. 🙂 Thanks for the movie tip! Happy travels and enjoy Singapore and Gardens by the Bay next year!